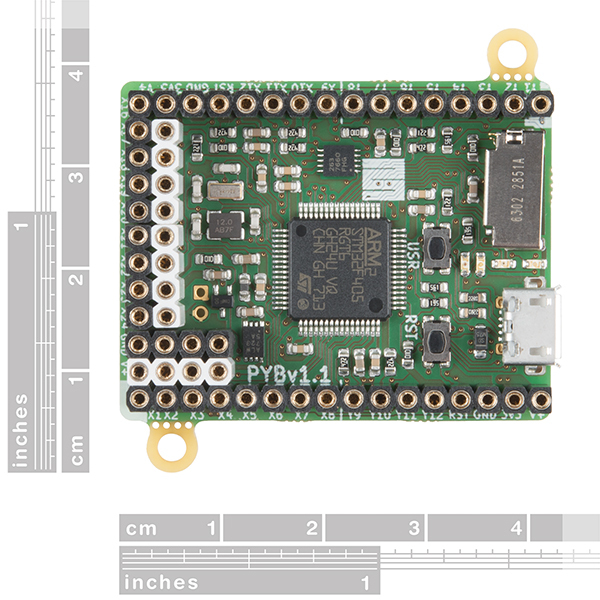 At its heart, the MicroPython pyboard possesses a STM32F405RG microcontroller with a 168 MHz Cortex M4 CPU, 1024KiB flash ROM, and 192KiB of RAM. 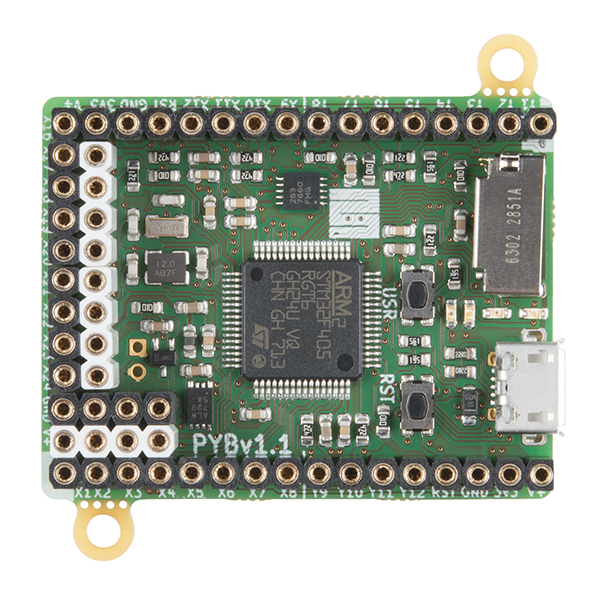 Each pyboard is also equipped with a microUSB connector for power and serial communications, a microSD card slot, an MMA7660 3-axis accelerometer, 31 GPIO, four LEDs, a reset switch and a user switch. We have two options for the pyboard: one with headers and one without. MicroPython is a complete rewrite of the Python (version 3.4) programming language so that it fits and runs on a microcontroller. It includes many optimizations so that it runs efficiently and uses very little RAM. Additionally, MicroPython runs bare-metal on the pyboard, and essentially gives you a Python operating system. 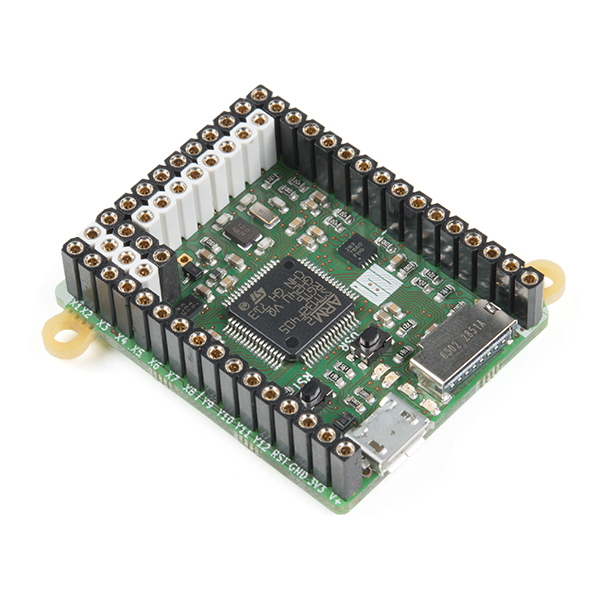 The built-in pyboard module contains functions and classes to control the peripherals available on the board, such as UART, I2C, SPI, ADC and DAC. Do you sell the headers that are on that board? If not, what do you call them? Having Micropython as the operating system eliminates much of the overhead of having a Linux system. The clock speed is a little slow for some complex tasks, but the MicroPython makes it much easier to do complex tasks than bare-metal programming. For testing various chips, especially ones with weird I2C registers, or other protocols that may be out of the mainstream, this board is great. And the python code that you develop for the problem chips is easily ported to C or anything for embedded work. 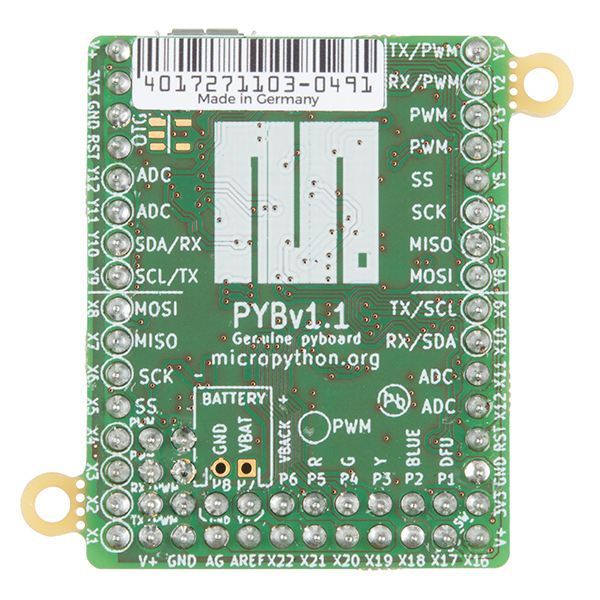 The Pyboard makes using MicroPython very easy. Got it very quickly. Hooked it up and it works perfectly.